Some businesses and organizations make huge gains when they employ cloud contact center solutions, easily reaching more clients and subsequently benefiting from increased collections, profits, and loyalty. Other entities struggle. The difference can be explained in one word: implementation. How you use any technology, including a cloud based call center, determines the final outcome. If you want to see increased operational or agent efficiency, grow profits, “cut the fat” on the annual budget, or reach more clients, read on. The following tips cover both strategic and task-based best practices to ensure you define not only the final destination but also the steps to reach it. You purchased a leading collections contact center software. Fantastic! Before you let agents use it, though, take a step back. Talk with other department heads to figure out what the end goal is. If you claim more than one goal, prioritize them. You can tackle every goal possible, but the chances of achieving all of them at once are slim. Focus on one goal and complete it. Then, use the lessons learned from it to inform the next goal. It’ll make future goals that much faster and easier to reach. With the end goal set, brainstorm the steps needed to reach it. These steps will eventually become the milestones and metrics for success, so take your time. Make sure you cover everything, from infrastructure needs to agent training. Your metrics reporting and analyses are only as good as your data pools. So, before you unleash the agents, clean up the data. Make sure agents, managers, and executives are working with the right data, which is best done by creating client records that unify scattered information and are clean of obsolete or inaccurate information. Clean data and unified client data help to not only reach more clients but also confirm results. Once the data is spit-spot, integrate the different streams. You probably don’t want to visit multiple reports or databases to pull numbers; neither do your managers or agents. Plus, integrating the data pools allows you to create single, holistic customer records, and they aid with keeping data consistent, accessible, and usable. No matter what line of business you work in, your clients likely aren’t all the same age or ethnicity. And, if you work internationally, the point goes double. Compensate for the diversity by segmenting clients into buckets, be they by age, product, geographic region, products, services or needs. Then, tailor communications to them. It’ll help you reach more clients, as well as keep the ones you already have. Clients don’t always want or need to talk to agent, so give them self-service options. Remember, too, to make it easy to pay. The simpler you make the process, the more clients you’ll reach and the more debt collections you’ll make. TCN makes the payment process fairly simple with its API Integration. Simply pull in whatever debt collection software you use, and then employ TCN’s cloud based call center to manage client communications and collections. Along with self-service options, invest in newer technologies like chatbots and SMS. Clients enjoy the tools, as evidenced by Software Advice, No Jitter, and customer experience consultant Micah Solomon. TCN offers a text-message service, AgentSMS, that can be integrated into the cloud based call center strategy for outbound campaigns of all stripes. TCN’s integrations also make it easy to add email, helping you reach omnichannel communication goals. Even with the best plans and tools, your efforts to reach more clients could fail if you disregard the human element. Don’t! Implementing cloud contact center solutions requires working with your department heads, managers, and agents to: reach consensus on the end goal and train them in current standards and best practices specific to your collections contact center software. Clients want to speak with a human, not a rigid or jargon-filled script. Also, try a mock phone call and web interactions to train agents in clarity and brevity. Now comes the fun part—measurement. You should find this best practice relatively easy to do since you set quantifiable end goals and milestones. You may look at other data, too, like customer satisfaction, first call resolution (FCR) rates and agent efficiency. To take your metrics and analyses up a level, consider using TCN’s Business Intelligence solution. It augments the TCN cloud based call center to reveal not only how your efforts affect business goals but also uncovers untapped opportunities with clients and market verticals. Once you finish your analysis, put the numbers to work. Use data to inform business decisions from the top-down, and from the bottom-up. You may discover, especially after an initial implementation of the cloud based call center, that your goals need to be updated to better reflect clients’ needs and business aims. It happens to almost everybody, so don’t panic if it happens to you. Reset your targets periodically to reflect realistic goals based on hard numbers. Don’t stay in the Stone Age when it comes to collections and communications. Start reaching more clients with a cloud based call center by downloading “Fred Flintstone vs. George Jetson: 6 Reasons Call Center Execs Are Moving from On-Premised Solutions to the Cloud” today. 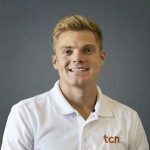 Mckay Bird is the Chief Marketing Officer for TCN, a leading provider of cloud-based call center technology for enterprises, contact centers, BPOs, and collection agencies worldwide. Mckay oversees all marketing operations, campaigns and conferences including; content production, email marketing, and other inbound marketing activities.